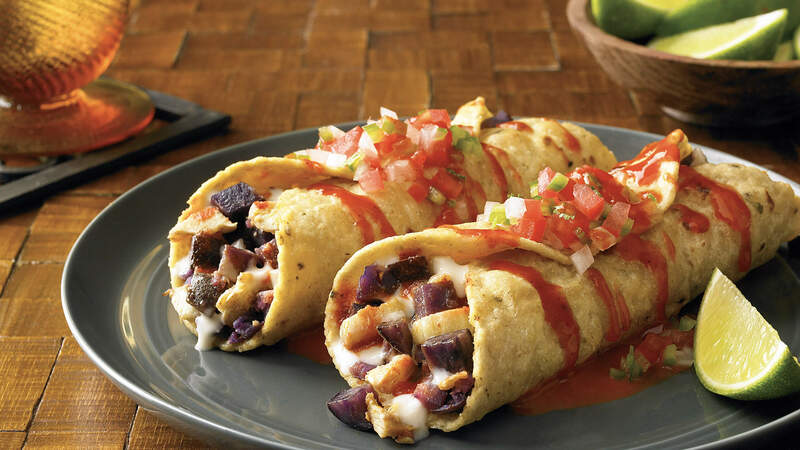 Try these Artichoke Enchiladas for a hearty vegetarian recipe that’s isn’t shy on flavor, with purple potatoes, artichoke hearts and three spicy sauces. Vegetarian menu items are featured on 36% of restaurant menus and are growing in demand. Queso fresco --- 4 oz. Flour tortillas (6-in. diameter) --- 4 ea. Enchilada sauce, hot --- 12 oz. Combine artichoke hearts, smashed potatoes, TABASCO® Habanero Sauce and queso fresco; mix and season with salt. Place one-quarter of the mixture into each of the 4 tortillas; roll and place on a plate lined with enchilada sauce. Garnish with shredded lettuce and pico de gallo.